I was asked to participate in Evite’s #EviteBabyTrends series. Although I have been compensated, all views and ideas are my own. This post contains affiliate links. If there is one thing I love most about parties, it is party games. I personally think that the games at a party, or in the case of today’s post at a baby shower, can take a party from being okay to being one people are talking about for months. Today I’m continuing my spring baby shower series by sharing three of my favorite baby shower games. I’ve included all of the instructions, printables, and even some fun prize ideas because games just aren’t as fun without prizes. One of my five tips for hosting a baby shower is to plan games that match the mom-to-be’s personality. I chose three games that are different in the amount of interaction, time, and skill involved so there should be something that works for every baby shower and mom-to-be. I love games so I’d be good with all three, but I know some women would rather the games be quick and low-key instead. No matter your mom-to-be’s preference, I’ve got you covered. Involvement Level: Out of the three, this will take the most time and effort. It also is the most interactive of the three both for the mom-to-be who will be answering questions and the shower guests who will be covering their bingo cards. Preparation: Before the shower, ask your guest of honor 24 different baby related questions. You can either use this list of 24 that I’ve created or come up with your own. Write the answers to the questions in random order on these blank bingo cards and pick up a couple of prizes for the winners. Play: Give everyone other than the mom-to-be a bingo card that’s been filled out with all of the mom’s answers and a cup full of bingo markers. I used spring colored jelly beans to match my theme. Once everyone has a card and markers, go through and ask the mom-to-be the list of questions again (you might want to switch up the order) and have her tell her answers to the group. As she gives an answer, guests should cover the corresponding space with that answer on their bingo card. The first person to get five across, up, down, or diagonal wins a prize. Since you’re only asking 24 questions, you’ll want to tell everyone beforehand that the first five (or another number you choose) win. Involvement: This game is very quick, only takes a few minutes but it does require guests to stop what they’re doing and pay attention for those few minutes. It’s a fun one and most people won’t mind the quick break even if they aren’t game people. I’ve played this at a bridal shower before and thought it would be fun to write a baby shower version of my own. Preparation: Gather enough pens, paper, and hard things to write on (books, movies, etc.) as there are guests at the shower. Print out this poem and buy a prize for the winner. Play: Give each guest one pen, piece of paper, and a hard thing to write on. Tell them that they need to pay close attention for the next five minutes. Read the poem out loud and have everyone follow along, adding and subtracting points individually on their own sheet of paper. Once you’ve finished reading the poem, have everyone tally up their scores and give the person with the most points a prize. 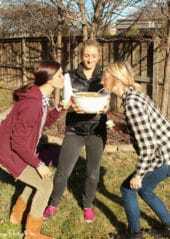 Game #3 – What Does the Cake Cost? Involvement: This one is the least interactive of all. 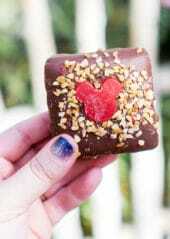 Guests can “play” this game as they are mingling, eating, etc. Prep: Make a diaper cake like this one. When you’re buying your supplies for the diaper cake keep track of the cost of everything you buy. Write down a list (excluding the prices) of all of the items in the diaper cake (in case you have fun surprises like I did) and put it next to the diaper cake at the party. You can choose whether or not to put the number of diapers or just write diapers to make it more difficult. Cut slips of paper and put them in a bucket next to the diaper cake. Play: As guests arrive, tell them to try and guess the total cost of the diaper cake. Have guests write their name and cost on the slip of paper and either put it in a bowl or give it to you. At a designated time during the shower, announce the total cost of the cake and the person who is the closest. Give the winner a prize. Follow the instructions for Name that Tune (Game #3 from my black and white party) using songs with the word baby in the title. Here is a list of 50 songs with the word baby in the title ranging from Justin Bieber to The Beatles. You can click on the link below to purchase the song or find the song in iTunes. A printable copy of this list is available here. Still need more baby shower game ideas? These 20 baby shower games are hilarious! Great ideas!! 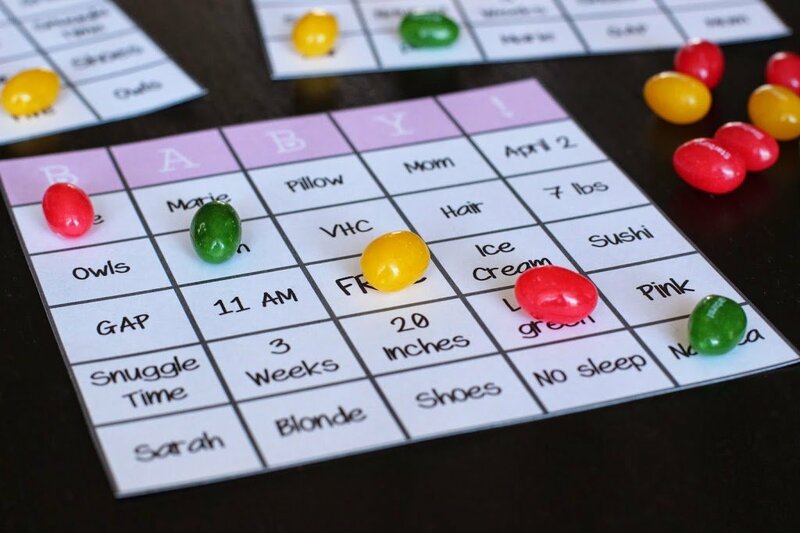 I esp love using those colorful jelly beans as bingo markers! How fun! These are definitely among some of the best baby shower games I’ve seen. I’m not a fan of the blind taste tests of baby food where you have to guess what they are…blegh! 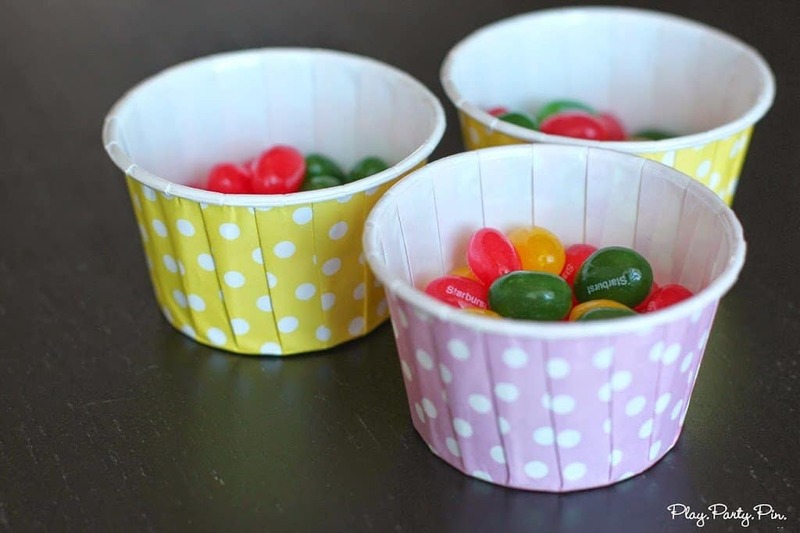 Using the jelly beans is a clever idea! fantastic ideas of baby gifts. I’m trying to download everything for bingo. When I tried to download the list of questions it says it is no longer available. Can you help me with this or is it gone now? Thank you! This is by far the best and cutest games I’ve found. Sorry Emily, I’ll take a look at it first thing tomorrow. 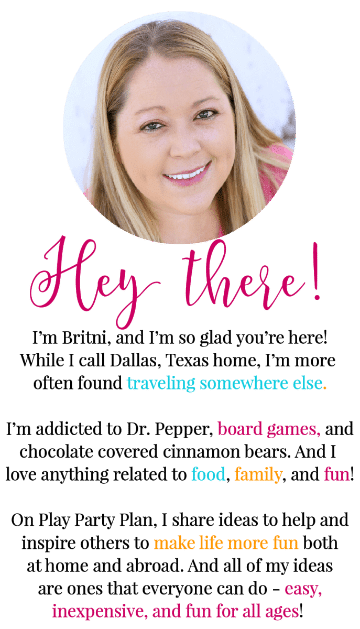 Or if you email me at Britni at playpartypin dot com I can send you all the files directly. 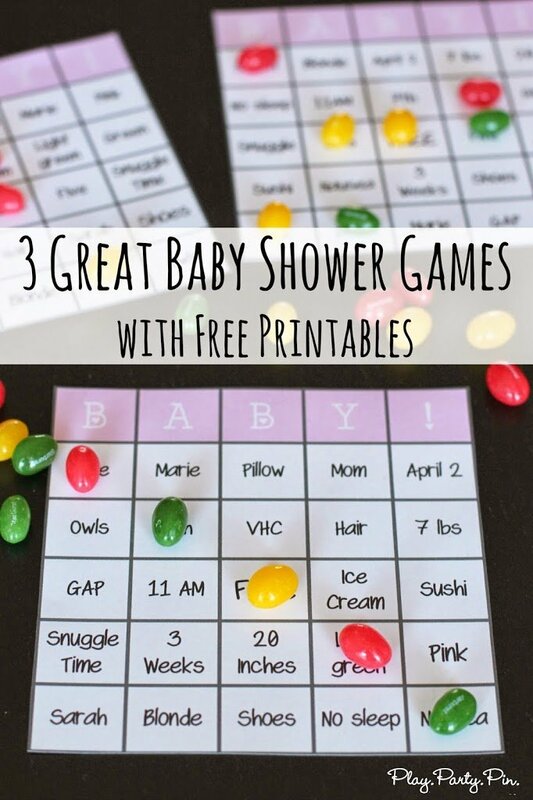 I love these ideas for baby shower games. So many baby shower (and bridal shower) games are either lame or weird. I just want to say thank you for making it so easy to share these baby shower games. Most sites want you to provide all you personal information and create a password just to have access to their information. 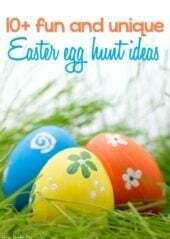 We are planning the baby shower and were looking for games when my niece suggested Pinterest to find ideas. Thank you! I am grateful for your willingness to share without the hassle. I’m so glad you like them Zelda! I’m trying to download, Baby Shower Name that Tune, it sounds like a great game for my friends, can you help???? I’m so sorry Kathy, I’m just seeing this. Did you get it to download? You just need to click on the link or the image in the post and it’ll open up a downloadable PDF. Here’s the direct link – https://www.playpartyplan.com/wp-content/uploads/2014/04/Songs_With_Baby_In_Title-PDF.pdf. Please can you email the bingo Card blank sheets? They do not download from your link. I don’t get the poem game, am I missing something? the poem is read and you add and subtract what? can you explain it better? I apologise if I’m reading it wrong. Would it be possible to get the link for the points poem game?